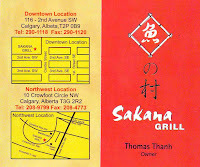 Chinese (Asian) food in Calgary, Alberta. I have been meaning to post this on March 8th for International Woman's day. The number 38 (from the third month eighth day) or San Ba (in Mandarin Chinese) is an indirect way of saying 'mean woman' in Chinese. Now I am sure you are asking what does that have to do with this restaurant? My favorite entry on the menu here is number 38. 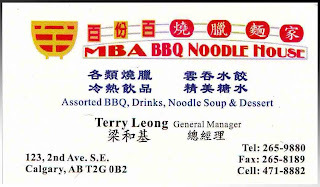 This restaurant is surround with lots of Vietnamese restaurants in the Forest Lawn Area. They have ample parking and open till 9 PM. 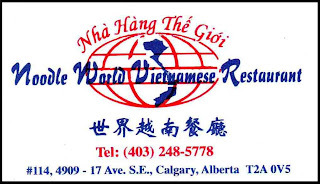 They are larger than most Vietnamese restaurants in Calgary and you will see something that you usually don't see in Calgary. Large groups of Vietnamese family's go here to eat (more than 6...). The dollar to meat ratio is high just like MBA. You get a really good portion and food for you dollar. #38 Noodle World Vermicelli Special $10.50 (Bean Curd Skin with Shrimp Paste, Spring Roll, Charcoaled Pork and Shrimp on Vermicelli). They will add extra pickled carrots and cucumbers at no additional cost. They rock for doing the little changes for free. #53 Noodle World Broken Rice Special $10.50 (Vietnamese Sausage, Charcoaled Pork Chop, shredded Pork, Bean Curd Skin with Shrimp Paste, and Steamed Egg Pork Cake over broken rice server with sweet Fish Sauce. #32 Stewed Beef with Noodles $7.50 (The name says it all. It is served with rice or egg noodles). My favorite is to pay a little more get extra beef and some tomatoes with it. All these dishes have large portions that could feed large families in Vietnam. The only really sad thing with the restaurant is that their specials for 2 or 4 persons are not really that good. They get a little pricey and just don't have the kick that the other dishes have. If you stick to all the single portion specials this restaurant will not disappoint. 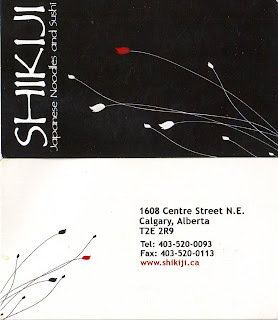 I had gone to the Shikiji restaurant when it had first opened and I don't really remember much but I had no desire to really go back again. Now I believe that like anything in life you never know when things change. I thought I had better go when I have heard 3 or 4 different people talk about the restaurant. This included some Japanese people I heard talk about it. I don't know too many Japanese people and I always like trying authentic food. So I had some meetings to finish before I was able to meet some friends at the restaurant but I thought it would be no big deal to get in. Its on Centre. What place is busy on Centre Street? Well thats the first mistake. I walk in and BAM. There is like 7 people waiting ahead of me. Check out their web site. Call for a reservation and save some time. I don't believe in waiting for anything so if you go here call in advance. So after waiting for some people to clear out I finally get to sit down just as my dinner guests arrive. I think they sort of planned that. So our meal starts with the soup and then ends with the raw fish. Its really interesting. When you try a food and say I really like that. And then. One day you try the same food cooked by someone really special. Well, the Salmon Sashimi was the freshest Sushi that I have ever eaten. It was not to thick not too thin perfect in thickness and in presentation. With the Wasabi it was soo good it was like candy. I really think that I will have trouble eating at other Sushi restaurants after eating here. It has been a long time since I was impressed at a restaurant and I think for Japanese food this is a good place to try to set your bar when you trying Japanese places. Just call ahead, I really hate waiting, its not like we don't do that enough now in Calgary because of the labour shortage. So I am stuck downtown and it 5 PM what do I do? I could try to get through the traffic or I could just grab something to eat and wait for the traffic to subside. After not getting meat at Sakana Grill I thought its time for MBA BBQ Noodle House. MBA is like HK fast food. Today is making up for last week. Driving past the restaurant a spot is available right in front of the restaurant. Its like a sign. Eat here. Going inside the place is fairly empty. With the prices being so cheap I never under stood why it isn't busier but who cares we are on a mission. It's Monday I have miscalculated. Today is Korean Rib day and not Chicken Skewers. Both are about $9.95 which is cheap for the amount of meat but on the "Special" day you get $2 off and the soup of the day included. As far as I can tell the soup of the day here is always Chinese vegetable pork soup. Its good but if you are Jewish or Muslim it not the soup of choice. So upon ordering the Korean Rib's with some Dry Scallop Congee ( Not Gongee as spelled on there menu ) we wait for the food. The waitress comes back and says that we have our choice of drinks because we didn't get the soup so we order lemon tea. Which is the normal house tea with some lemon. Expensive if we order it alone but refreshing when we get it free. We start with the soup and the congee is great. Not that I think I have ever had bad congee but hey I am hungry and it really hit the spot. I never really had Dry Scallop Congee before but it was good. maybe a little stingy on the dry scallop but for $5 it was good. Not even finished with the soup the main course comes. A hot plate of three large Korean Ribs, a bowel of rice and a gravy train of black pepper gravy. Hmmm. With this being around the same price of McDonalds I am not sure how they do it but I am thinking too much. Cutting the ribs and dipping them in the gravy or adding the gravy to the rice with ribs its your choice. Its all good. I have been here before and I need to remember Tuesday is Chicken day. Next time. This is my first blog so let me get my format straight before I start posting too much on a regular basis. My first blog will talk about Hot Pot as in Fondue. There are many different styles but for today I was thinking Japanese. With the cold weather about to disappear this is a good time to get out the chop sticks and go to town. Usually the restaurant is hustling with people but today the grills are empty and we should be able to get a booth. Its in that time that I realize a Calgary Flames games is on. With the restaurant not really busy I hope that this will lead to an unpresidented service, and food. Only waiting a minute we are sat down quickly at a booth. Yes, looking on the menu the Shabu Shabu is still there. I am so hungry this better be good. Only waiting a few minutes the waitress comes and and we order the Shabu Shabu right off the bat with some Japanese Green Tea. The tea comes quickly then the burner to heat our food. After about 5 minutes the pot comes with the soup to cook our food. Kinda bland looking and smelling but hey it not all here. Then it comes. The food arrives with one plate of beef per person ( @$18.50) and a plate assorted vegetables Bok Choy, mushrooms (a few), baby corn, tofu (lots of it), and noodles. The beef is like 8 very small pieces. I have never seen beef cut so thin for the hot pot. This is it. After crying for a minute we start the process of cooking the beef first. Just before it is done cooking the waitress brings Steak Sauce and Ginger Sauce that is usually used for the grill items. Ok here we go. After devouring the beef in a few minutes we decide to order another plate each of beef and start in on the rest of the food. Now we spend another hour eating Tofu and vegetables. Which don't get me wrong are heathy but just not really something that really grabs you. As Hot Pots go I would rate this a 6/10.